It’s December 2007 in Minnesota. It’s not a post-apocalyptic wasteland, but it’s snowy, and it’s really damn cold. Cold enough that people are gathered around a fire as they wait in a pre-dawn line at the dead-end of a road in a north-Minneapolis suburb industrial park. 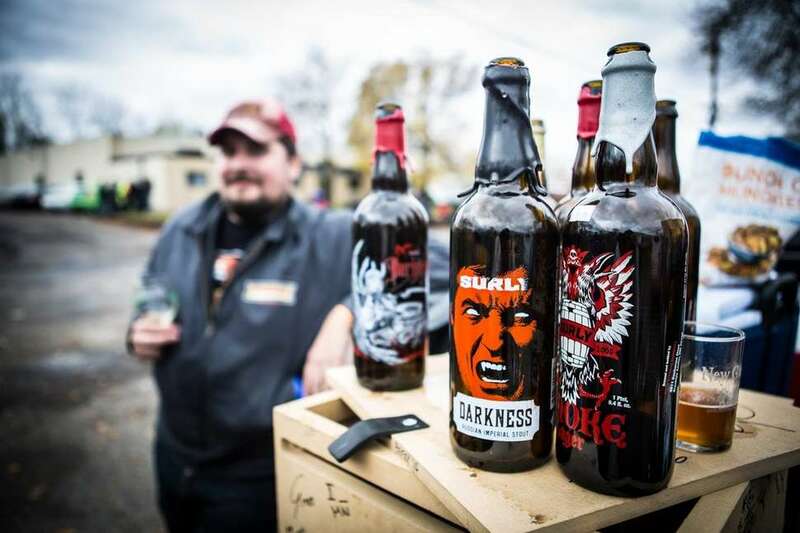 They’re huddled outside a chain-link gate hoping to get their hands on Surly’s Darkness, a Russian imperial stout served in 750-milliliter bottles. But in 2007, in this part of the country, this isn’t really a thing people do. People don't wait in line for beer in the snow. In 2007, breweries aren’t even allowed to have a taproom in the state. Few people in Minnesota knew the craft beer scene as well as Omar Ansari, founder and owner of Surly, one of the state's best breweries. But even he was surprised when he showed up for work that morning. It was the first time the brewery had bottled Darkness following a limited growler release the year before. In fact, the law had only recently changed allowing Surly to sell 750s at the brewery. The thick, dark, sweet brew is the kind of beer that is the mac to a Minnesota winter’s cheese. “It made an impression on a lot of people the year before when it was available mostly just on tap outside of those few growlers,” Brausen says. Ansari's team was excited, but didn’t expect it to go the way it did. “I’m like, ‘What the hell are you doing here? It’s freezing out!’,” he says. “I got there early, and I figured people would be showing up early, but I sure as hell didn’t think they’d be showing up that early. This scenario, in an altered form, persists today. When people lined up for the beer that first year, they didn’t just sit there. 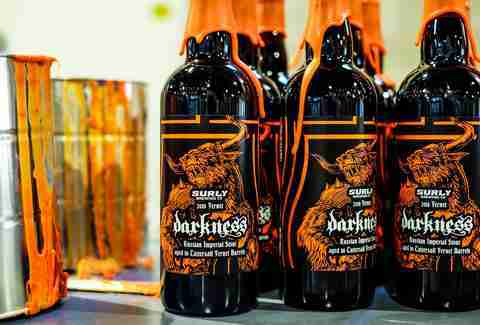 They exchanged bottles of other beers, drank, and formed a communal bond that remains the basis of Darkness Day, the now massive annual release day for Darkness. The day has evolved over the years. It moved outside at the Brooklyn Center brewery, which still pumps out beer despite the opening of Surly’s massive destination taproom in Minneapolis, and survived the departure of beloved brewmaster Todd Haug. Now, the day has grown larger than an industrial park parking lot can accommodate. It also took place on Halloween in 2018, so there's less chance of snow (though, because this is Minnesota, it did snow on Halloween anyway this year). This year Darkness Day moved to an amphitheater in Somerset, Wisconsin, where the brewery presented two days of music featuring Carcass, Sick of It All, Murder City Devils, and others. It also invited more than 60 breweries to share their own beer, released three Darkness variants in bottles for the first time, and had people camping out and exchanging bottles. In many ways, despite the day’s growth, the spirit of that first Darkness Day is alive. Nowadays, you don't need to wait in line. The fans do anyway. It’s not surprising that the reputation of Darkness is somewhat shrouded in, well, darkness. It drinks deeply of its own -- partially self-created -- mythology. People do wait in line. People love the beer deeply. Many stores sell out quickly. But not all of the beer disappears instantly. I found 2017 Darkness at a liquor store just days before this year’s Darkness Day. It’s not necessarily easy to find, but it’s around. What has continued the reputation of Darkness as a beer worth waiting in line for is the community. Even as Darkness Day expanded this year, people lined up hours in advance to get their bottles even though bottle were guaranteed with their ticket, according to head brewer Ben Smith. 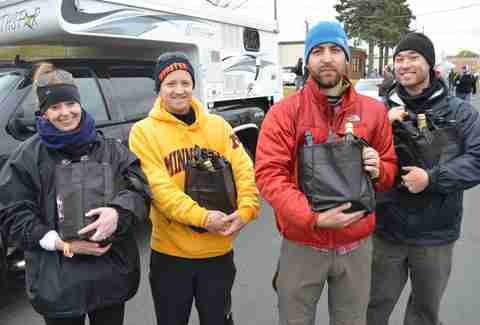 The brewery even got the Somerset campground to waive its no-bottle policy so the bottle exchange could live on. People love Darkness, but it intentionally doesn’t drive the kind of insanity some limited release beers, like Toppling Goliath’s KBBS. Darkness thrives on community more than scarcity now, but they still welcome you to wait in line.